A Kalira, also known as Kalire, is a traditional piece of ornament that is tied to the Chooda (set of bangles) worn by the bride on her wedding day. Chooda is a set of white and red bangles worn by the bride, which is known to be the evident mark of a new bride and is also known to bring good luck to the new couple. 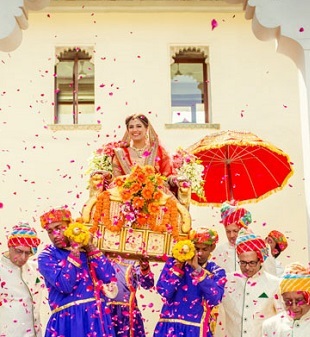 The Chooda is worn throughout the wedding ceremonies for a period of over a month! The Kalira first came to be used in Punjab in the 1900s. 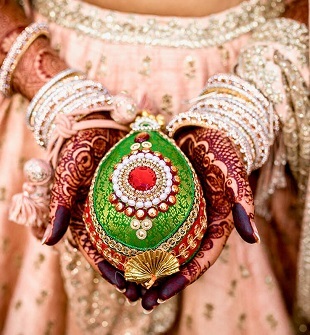 A Punjabi bride’s attire is said to be incomplete without the Kalira. 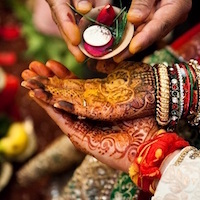 The Kalira tying ceremony is a special ceremony in Punjabi weddings. 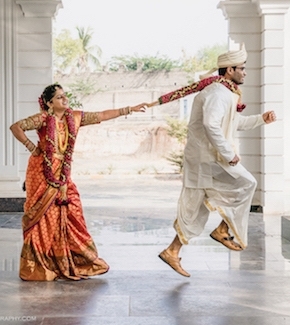 An exclusive, fun-filled ceremony for the ornamentation of a Kalira takes place before the wedding, where all the women of the family gather and actively participate. The Kalira, which was traditionally made of flowers, beads, and shells, is said to signify happiness and prosperity. Over time, however, the traditional Kaliras were replaced by gold or silver embellished, umbrella-shaped ornaments. The present-day Kaliras have come a long way from the traditional Kaliras. The intricately designed Kaliras of today are a no match to the simple, modest traditional ones. Brides today, often put a lot of thought into the design, style, and color of the Kalira. Some try to match it with their attire and ornaments while others go for a contrasting one. Some go for heavy, eye-catching ones while others choose to wear simple ones. Whichever the case may be, Kaliras are certainly an important part of a Punjabi bride’s ensemble and the market is providing the to-be brides with numerous options to choose from. The most popular styles of Kaliras comes in different forms. Tassel kalire, Ghunghroo kalire, False flowers kalire, stones and pearl kalire, etc., are a few styles of kalire that the brides have largely shown interest in. But what’s been trending recently is Kaliras made of real flowers! Yes, that’s right. The traditional flower made Kaliras are back in trend and the brides are increasingly turning towards Kaliras made of real flowers for their wedding. Why Are Kaliras Made of Real Flowers Back in Style? Natasha Arora, the Ex Miss India USA is to be thanked for bringing back the traditional Kaliras! Natasha, who tied the knot in September 2017 had a four-event fairytale wedding ceremony in Dallas. Although she wowed everyone with her beautifully designed wedding clothes and jewelry, what drew everyone’s attention is the unusually large, but stunning Kalira made of real flowers! This Kalira was made of numerous varieties of white roses, all put together to make this exquisite piece of ornament, which was carried quite elegantly by the beautiful bride! Not only the Kalira, but her wedding outfits and accessories also had a touch of floral to them, giving her wedding a bohemian vibe. Kaliras made of real flowers add a touch of nature to the wedding attire. They add a pop of color to the outfit but can also be quite difficult to carry as they are delicate. Nevertheless, they can be personalized to match your outfit and the colors you are wearing. But they also have an added advantage of being relatively light when compared to the heavily embellished Kaliras. Among several types of Kaliras made of gold and silver, real flowers are indeed a breath of fresh air. They are the latest trend in the world of Kaliras and surely, Kaliras made of real flowers are going to be huge this wedding season!